Onboarding is so much more than filling out forms. It's the welcome wagon, the mentor, the office tour, the team. It's what to wear, where to go, and what to do when you get there. Strategic onboarding takes things to the next level. It's the experience you expect your talent to have and the extra push needed to speed talent’s time to value. It’s a new world of work. Employees move from project to project, employer to employer, and contract to contract. If you want to attract, retain, develop, rehire, and obtain referrals from your ranks of talent, then you need to provide the experience that they expect - when they expect it. Do you FedEx your new hire a massive – and slightly terrifying - stack of papers to complete before their first day? Or do you invest in an automated onboarding solution that's mobile-optimized, self-guided, and easy? That’s like asking if you want to get directions using your smartphone or using a janky old folding map. Moving to a paperless process reduces overhead costs and increases data accuracy for the company while allowing hires to interact with your organization whenever, wherever, and however works best for them. 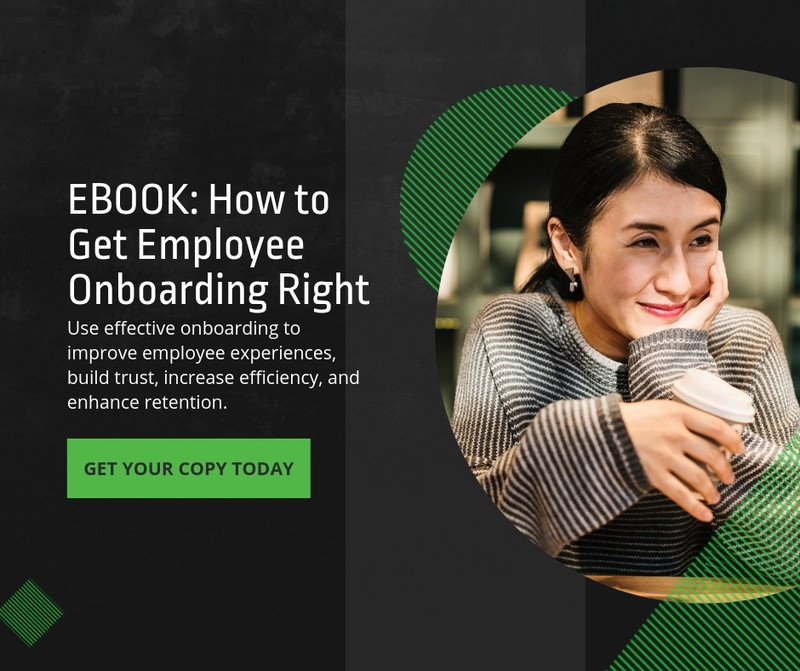 Second rule of creating a strategic onboarding program: New hires expect a modern experience that's consistent, engaging, digital and mobile. Use an automated solution to build that experience. Now that you're providing hires with a modern, mobile experience right after they accept the offer - what forms do you actually include in a strategic process? Unfortunately, there's no super-secret mix of forms that'll lead to instantaneous success. The tactical content required for onboarding changes for each organization depending on location, size, industry, and stakeholder needs. TACTICAL content is the nitty-gritty, must-have requirements of employment. Think I-9, W-4, and other standard government or organizational forms hires need to complete to be considered "employed." So how do you find the balance of content that meets compliance requirements without bloating the process? We recommend you start with an inventory of forms you think are "required" for the organization and break it down from there. Get together with Legal: Which forms need to be created or updated to be compliant? Can you remove any forms? Then take a look at your other organizational forms. Which ones provide value to the hire? Can you condense or remove any forms to streamline your process without taking relevant information away? The goal here is to remove the legal and organizational bloat to streamline the experience for hires and free up time and resources for other - more engaging - activities. Third rule of creating a strategic onboarding program: Less is more. Keep the legalese, long policy forms, and data entry to a minimum. Only include what is absolutely necessary for compliance and the employee's success. Side note: If you're using Click Boarding, your standard government forms are already covered. We've streamlined and simplified the Form I-9 and W-4 to increase speed of completion and accuracy. It's already included in your package - just drag and drop the form into your process, set a due date, and add email reminders for the hire and HR. You can even create different process flows for different roles or locations - which will help streamline further. Once you've got tactical ironed out, it's time to layer in the "FLUFF". Fluff is any action - automated or otherwise - that helps build relationships, entrench the hire in company culture, and foster early and continued engagement. This is where you confirm the dress code, provide directions to the office, make introductions to the team, assign a mentor, and so on. Here’s the deal: while most people think of it as "fluff" this is not just "warm and fuzzy feel-good" content that can easily be ignored. If the powers at be in your organization are know to say things like "Happy hires are great, but is it really necessary in a strategic process?" the answer is: ABSOLUTELY. “Great talent starts with great onboarding. "If we can focus on engaging and ramping up our employees more effectively, we can possibly extend the productivity value and longevity/tenure of our people. The more productive and engaged our people are, the stronger the connection to positive revenue impact." Fourth rule of creating a strategic onboarding program: Be human. New hires are excited, motivated and ready to engage – share their enthusiasm and show you care. They'll thank you later through referrals and brand advocacy. Now that we've made it to the end of the list, let's review our high-level strategy. NOW. That's when they expect it, and that's where you'll see the highest return. AUTOMATED AND MOBILE. It's not 1997, Karen. Get hires the information they need in the way they expect it to be delivered. Onboarding is the start of a new hire's journey with your company. The experience they have before Day One and beyond directly impacts productivity, engagement, and brand loyalty. If you provide just the slightest upward tilt to their trajectory, you'll see fantastic returns throughout the talent lifecycle. The best news? Strategic, modern onboarding is a win-win that’s easier than you think. Ready to get started with your own strategy? Let's talk.